Does Your Electric Blanket Need A Replacement? 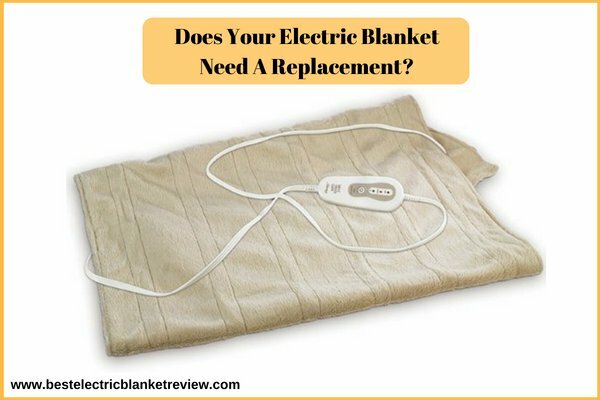 Does Your Electric Blanket Need A Replacement? Watch Out For These Signs! Whoever said that winter chills aren’t easy to deal with must not have felt the comfort of an electric blanket. Unlike the traditional ones, these are much advanced and energy efficient. Even under the harshest freezing temperature, an electric blanket provides a comforting experience. But, similar to many other electrical appliances, this too comes with a lifespan of 10 years. However, during all this time, how will you know if your blanket will actually last that long or is it time to retire the product? We will tell you about a few signs to watch out for! Is the outer fabric torn? Is it all worn out? Are there any unnecessary folds or creases? Do you see discolouration? If yes, you know what to do – a total replacement. If you are still using an electric blanket that has a poor fabric condition, you are exposing yourself to many hazardous conditions. As the fabric tears, the wiring mechanism can be tapered or cause dangerous circumstances. So, it’s better to replace the product and get yourself a new one! Faulty plugs and cables aren’t a comfortable situation. Rather, it’s a serious concern that needs to be fixed immediately. Wiring, plug or cable problems can damage the blanket completely or heat excessively and cause a fire. So, look out for any cuts, breakage, insulation problems or heating issues. If any of these arise with the blanket, call the concerned representative for a repair or simply replace the product as soon as possible. If you frequently experience fluctuating temperature in the electric blanket, it definitely needs to be replaced. The blanket may run too hot at times or might stay absolutely cold. Both the symptoms are enough to be careful regarding the slip-up. Such faulty controls can anytime lead to a fire or overheat. So, stay safe and watch out for the sign. If your electric blanket is more than 10 years old, it is time for you to consider purchasing a new electric blanket. The expected shelf life of an electric blanket is said to be around 8 to 10 years. So, any product that gets older than the suggested life expectancy needs a mandatory replacement. Newer versions come with advanced technologies as well as safety features that are necessary with the changing times. It is obvious for the wiring mechanism to give up on its working after some time. Reason can be anything – mishandling or surpassing the shelf life. So, no matter what, if you ever feel that the wires have started poking through the blanket’s fabric, know that this is one of the primary visible signs of electric blanket replacement. The wires could be broken or they could be in the verge of damaging. Therefore, you need to be very careful in using such an electric blanket. Getting a new one is the safest option! Not that we are scaring you with the after effects, you just need to stay cautious with an electric product and we are providing you with the essential tips. It may appear to be a complicated home and bedding product, however, once you purchase one, you’ll never snuggle under the old only-fabric blankets. Carefully read the manufacturer’s instructions mentioned on the product package. These are both kids and pets friendly. You’ll appreciate its comfort. But, watch out for the important signs of when the product will need a replacement. It is for the sake of your own and your loved one’s protection!